Joseph-Claude Bail was born during a period of intense disagreement in the Parisian art world. For several years the Salon juries had rejected many progressive artists works; printmaking was making a charge at establishing itself as a true art form; the Barbizon group of painters challenged the tradition of historical landscapes with their views of the modern countryside; and Realism was decades old and had brought forth such combative figures as Gustave Courbet. Yet not all artists can be said to belong this modern view of the nineteenth century. Numerous artists found prestige and public acclaim both at the Salons and with the public with works that relied on past styles and traditions influenced by the “Little Masters” from seventeenth century Holland and traditions from eighteenth-century France. Joseph Bail belong to this group; not an artist who sought to align himself with the increasing stylistic anarchy of the late nineteenth century, but one who carefully examined the changing needs of his patrons and gauged the underpinning social propensities of the time. In A Handbook of Modern French Painting, (New York: Dodd, Mead and Company, 1914, pg. 329) D. Cady Eaton wrote, before Bail’s death, that he “… is an attractive and popular painter…His pictures are comfortable and homelike; not startling and ambitious, but social and friendly. His position in French art seems assured.” Bail continued the tradition of Realism exemplified by Théodule Ribot and François Bonvin and received positive feedback which reinforced the continued respect for scenes reminiscent of daily life during the earlier years in France. While other artists were changing the shape of art through modernist distortions of form, the Bails looked backward, creating a painting style that showed a devotion to the past and reflected the values of former times. In a period of increasing modernity and industrialization, these paintings glorified the past ways of life in France and found a sympathetic audience in bourgeois patrons. Presumably beginning at a young age, Joseph’s initial artistic training began with his father who instilled in him a respect for the eighteenth-century French painters such as Jean-Siméon Chardin and the Dutch masters and encouraged him to view their works at the Louvre. (Weisberg, pg. 156) As all three members of the family, Jean-Antoine, Franck, and Joseph, were artists, the Bail family represents one of the few associations of family painters of the Realist tradition remaining during the latter half of the nineteenth century. They could often be found exhibiting alongside one another at the annual Salons, showing work which displayed similar qualities in subject matter. After beginning his training under his father, Bail began studying, presumably between 1879 and 1880, in the atelier of Jean-Léon Gérôme, an accomplished painter and teacher of the period. This was a short-lived period of tutelage as in 1882 he was no longer listed in Salon catalogues as Bail’s teacher, perhaps because Gérôme’s choice of subjects differed quite dramatically from those of his father and those that Bail would follow for the majority of his career. Just after his sixteenth birthday, Bail debuted at the Salon of 1878, alongside both his father and brother, with Nature Morte (Still Life). The still life tradition in France was invigorated by the work of Jean-Siméon Chardin in the eighteenth century and still lifes continued to be a major interest for many artists and many occupied themselves primarily with this type of painting. They figured as an important element of Bail’s work, and many of his genre scenes also show still life arrangements within the picture, even when they were not the primary focal point. 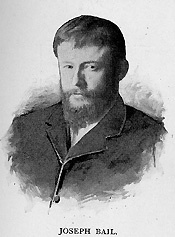 Henry Marcel (La Peinture Française au XIXème Siècle, Paris: A. Picard & Kaan, 1906, pg. 309) remarked that of these that his “Virtuosity rose from the cellars, from the kitchens to the peaceful linen-rooms and the discreet dining-halls, and amuses itself by following from object to object, the caresses of the furtive rays of light.” Bail himself was especially interested in the reflection produced on shiny copper or silver kitchenware, a most poignant suggestion of Chardin’s inspiration in his work. He excels at creating in all of his painting a very lively bright light due to the radiant shine of some brilliant point or to the direct projection of the exterior daylight…it’s assuredly the expression of an original and rather harmonious art. His technique is very delicate and his coloring just right. The composition of his painting, always elegant, is skillfully treated. Mr. Joseph Bail painted canvases of the most diverse genres: All of his works are interesting; but those that one finds the most remarkable are his interior scenes, so admirably and so precisely lit, so harmoniously composed, where the shine of the copper and the transparency of the glass add notes of a perfect precision. Bail regularly submitted to the Salons and towards the end of his careers was “hors concours”, or exempt from having to submit his works for jury approval. He received awards in 1885 (Honorable Mention), 1886 (third-class medal), 1887 (second-class medal), 1889 Exposition Universelle (silver medal), 1900 Exposition Universelle (gold medal), and 1902 (medal of honor). He was also named Chevalier de la Légion d’Honneur in 1900, and was a member of the Société des Artistes Français. He died November 26, 1921. Joseph Bail presents an oeuvre which was inspired by his father’s interest in earlier masters but also used the current trend in Realism, inspired by his earlier contemporaries such as Théodule Ribot and François Bonvin. 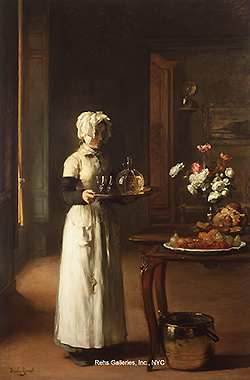 His playful images of cooks and their young assistants, along with an interest in light effects, established Bail as an artist who not only looked to the past but who used the modern movement of Realism to execute paintings that showed modern-day preoccupations with daily life that was becoming more and more rare in late nineteenth century France.